President Trump on Thursday claimed Mexico is the second deadliest country in the world, behind only war-torn Syria, prompting an official rebuke from Mexico's government asserting Trump's statement was not true. Mexico's Secretary of Foreign Affairs Luis Videgaray Caso responded to his tweet, disputing the claim. Videgaray Caso even tagged Trump in a tweet responding to his claim. The country's response came just hours after Trump fired off his post, blaming the drug trade for the increase in violence south of the US and using the issue to reference his campaign promise to build a border wall. While data released this week showed the number of homicide investigations in Mexico in the month of May hit a record high of 2,186 investigations, the wording from the president and comparison to Syria appeared similar to a report published in May by the International institute for Strategic Studies, which pointed to the approximately 23,000 killings last year in Mexico. The report compared those numbers to Syria's ongoing civil war, which claimed about 50,000 lives the same year. However, blankly comparing bulk crime numbers from one country to another, without taking into consideration the population, does not provide an accurate comparison. Instead, criminologists look at the crime rate (the number of murders per 100,000 people) to get a clearer picture of violence in a region. As the statement from Mexico notes, this measure shows the country has a murder rate of 16.4 — far from the highest in Latin America, let alone the world. 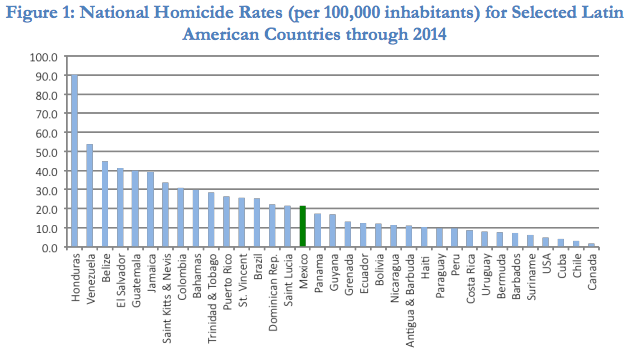 According to the latest data from the United Nations Office on Drugs and Crime, the Dominican Republic, Guatemala, El Salvador, and Colombia have higher homicide rates than Mexico. Honduras, with a homicide rate around 90 killings per every 100,000 people, tops the list of most dangerous Latin American countries — a point addressed in Mexico's press release, which also stated the US demand for illicit drugs is responsible for the rise of cartel violence inside Mexico. “Drug trafficking is a shared problem that will end only by addressing its root causes: high demand for drugs in the U.S. and supply from Mexico,” the statement read. For good measure, Mexico's statement was published in both Spanish and English. Trump Visited These Factories To Brag About Jobs. Now They’re Laying Off Hundreds Of Workers.